Önizleme boyutu: 800 × 510 piksel. Diğer çözünürlükleri: 320 × 204 piksel | 640 × 408 piksel | 1.143 × 729 piksel. 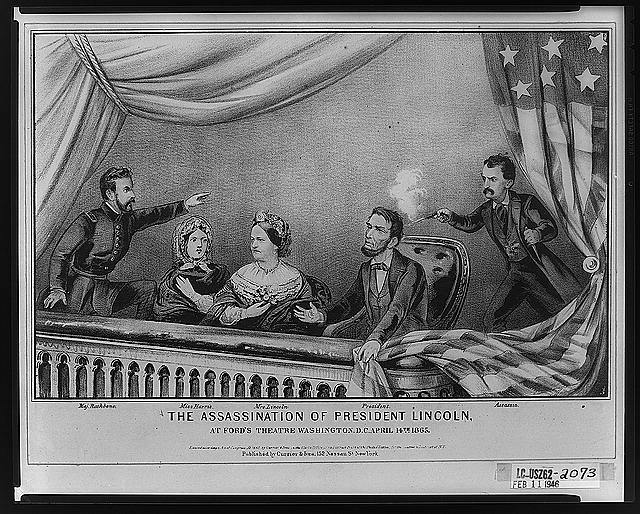 Lithograph of the Assassination of Abraham Lincoln. From left to right: Henry Rathbone, Clara Harris, Mary Todd Lincoln, Abraham Lincoln, and John Wilkes Booth. Rathbone is depicted as spotting Booth before he shot Lincoln and trying to stop him as Booth fired his weapon. Rathbone actually was unaware of Booth’s approach, and reacted after the shot was fired. While Lincoln is depicted clutching the flag after being shot, it is also possible that he just simply pushed the flag aside to watch the performance.